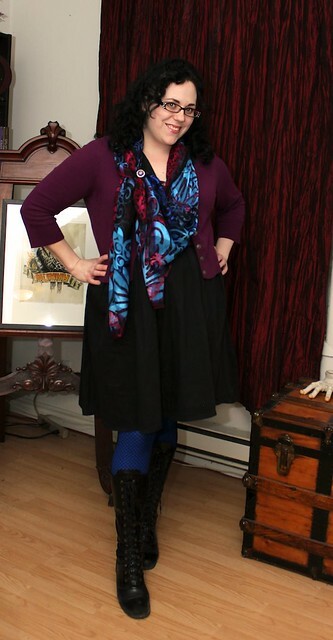 This outfit was completely built around the gorgeous scarf that I picked up last year. 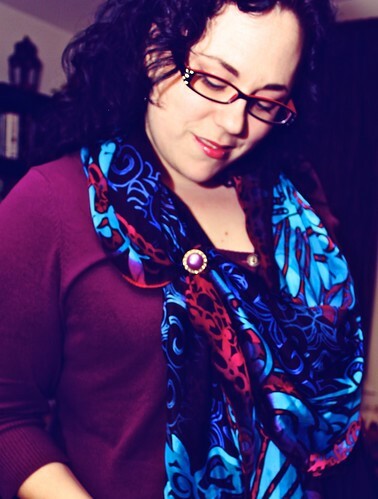 I am admittedly a scarf-a-holic but I normally buy cheap scarves while out thrifting, rarely spending more then $15 on any one scarf. 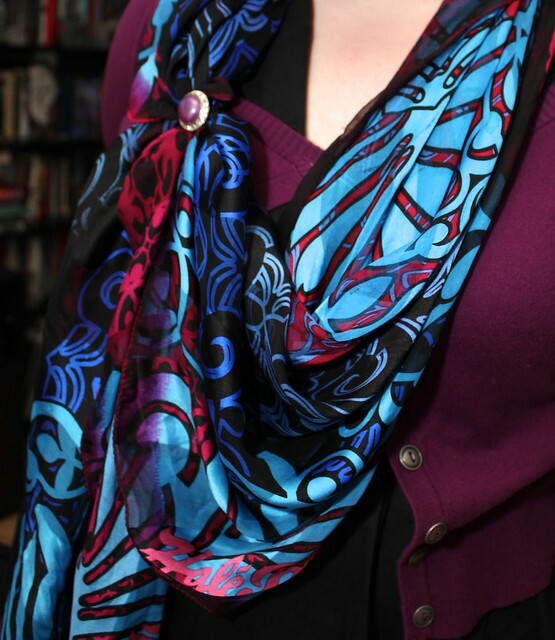 This particular scarf, however, I had noticed it at Winners one day as I was walking out of the store and it literally stopped me in my tracks. I think it was during a time when I was trying to branch out of my red black and white rut and this silky soft gem with its blues and teals mixed with pinks and purples opened up the possibilities of a whole new colour palette to me. Then I saw the price which was about $40, I balked and walked away. But the damn thing kept haunting me so a month later I went back and sure enough it was still there and I thought “What the hell”. It was the best wardrobe decision I could have made. It was a like a breath of fresh air into my closet, making me think outside of my safe favourites and I started thinking of all the pieces I could pair together that would never have occurred to me in the past. I think my personal lesson here is that yes a scarf is just a piece of fabric, but I am now convinced that they have magical properties. They have the ability to pull a colour blocked outfit, in colours that I never would have thought to pair, into something elegant and polished. I think in the future if I fall that heavily for a scarf that I can afford I will not second guess myself. Edited to add: Oops sorry looks like I had the flickr photos set so only I could see them. Should all be fixed now!